First up, just like the modular system itself – purchases through the kickstarter are piecemeal as well. Ranging in price from $19 to *gulp* $95 per tile. The tile set we’re looking at today is Ziricote wood. A dark wood with swirls of caramel or blonde running through it. It’s a very beautiful luxury wood and, if you can afford it, a favorite of mine! No white feet. The kinda cheap looking white plastic feet will be swapped out for a more stylish, possibly more “grippy” black rubber. All magnets screwed, not glued. The only exception right now is the Rolling Tile, whose sides are a little too thin for the screws not to poke through the sides. They look okay, but having one tile be different /is/ a little bit of a downside. They’ll snap together correctly/ aligned properly. I’m told that Wyrmwood has had some serious production delays due to faulty equipment. A problem that will be rectified during the course of the Kickstarter. These tiles were seated and drilled by hand. They turned out great, but still. Perfectly centered is never a bad thing. Each of the tiles measures 3.88 inches across, with each of the hexagonal sides measuring 2.24 inches. They’re similar in size to our previously reviewed Elderwood Academy Hex Chests. The tiles all come with three “feet” that are plastic/rubber spacers to keep the face of the tile from rubbing against the tabletop and act as pegs to align and hold the tiles together using three metal peg holes. Two of the peg holes are brass colored and one is steel colored. The steel/silver/shiny color is the “point” of each tile – and left a different color to more easily align the tiles and magnets so there’s no polarity issues. Most of the tiles also can be flipped and used as coasters – cork inlays help protect the wood from condensation or water damage. 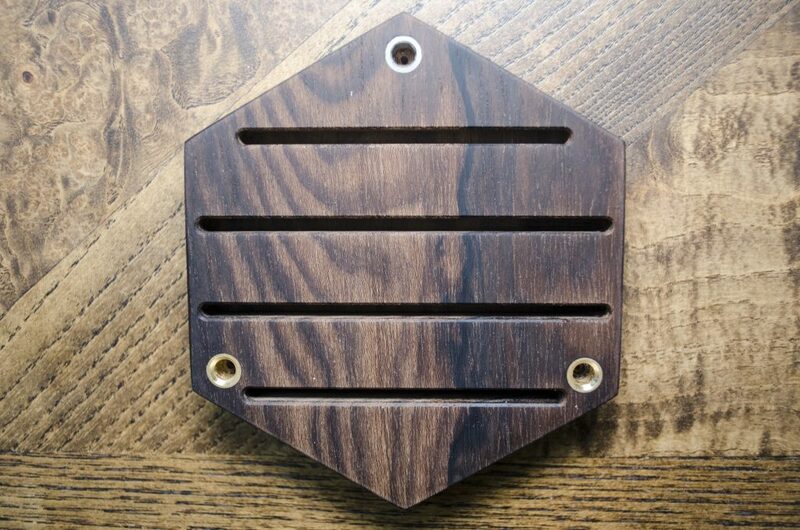 This little guy sports two small (2 3/4 inch) and two large (3 1/2 inch) slots to support game cards. 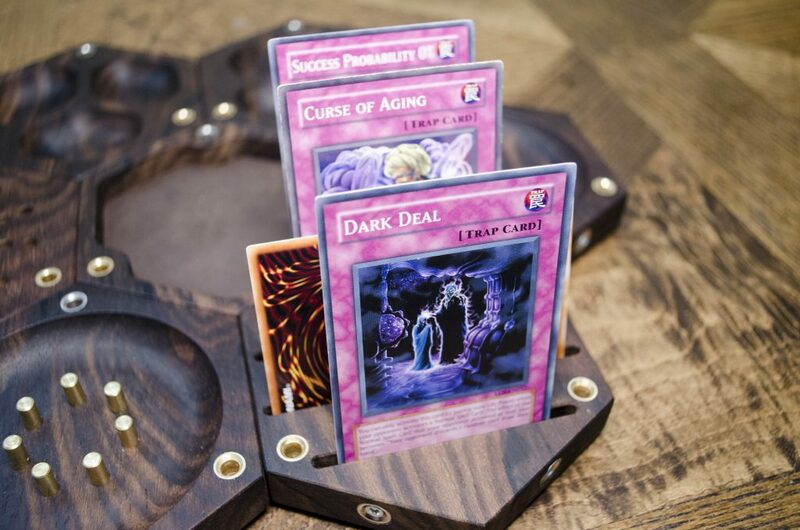 There’s enough space, to display 2-3 cards in each slot should the need arise. Likewise, you can lay some in the landscape position in the two center-most slots. My first gut reaction was “pffft, you can’t even see the cards in this thing I don’t think” but I ate crow. From a table height you can read them pretty easily. This tile, to me, jumps out as the most useful tile for any game involving cards. The good news, even very thick laminated cards fit with no issue. 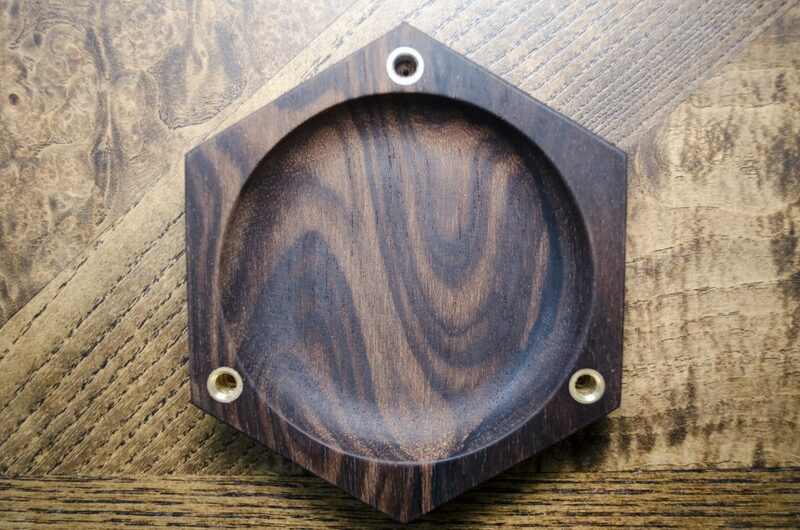 The single hollow is basically a large dish for holding gaming pieces – and a lot of them. This thing is nearly as wide as the whole tile and holds a “handfull” of dice (15 by my estimates). I can only imagine how many meeple or Catan pieces it could manage. Safe to say: a bunch. The sides are sloped, making it easy to scoop out the various pieces. I can’t help but think that the shallow angle of the sides is purposeful and well done. I think the Duo may be my second favorite [ba dum tiss] of the dish-style tiles. It’s got an interesting form and look to it. Everything the Solo Tile has going on, this has as well, but split in half. The shallow slope of the single tile is also copied here which makes each of the two hollows a bit smaller in total than the single. But not so very much so. Think “what would the duo tile be if it were a peace sign” and you’re mostly there. The Trio should be reserved for games with exceptionally small game pieces or circumstances where you need an exact amount of three different pieces. It cannot hold nearly as much as the Solo nor Duo but also looks a lot cooler, so – even trade. 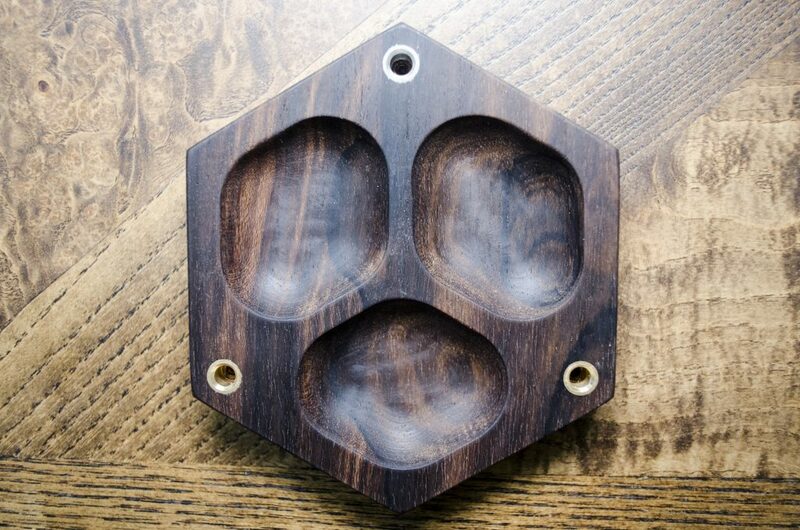 All the love and reverence of a Dice Tray in a 3.5 inch hex tile. This tile has sharp 90 degree sides and is lined with buffalo leather. I cannot help but crave this tile for Powered by the Apocalypse games – any game, really, that only uses a few dice. Space saving but still impressive, these things are my favorite of all the tiles. 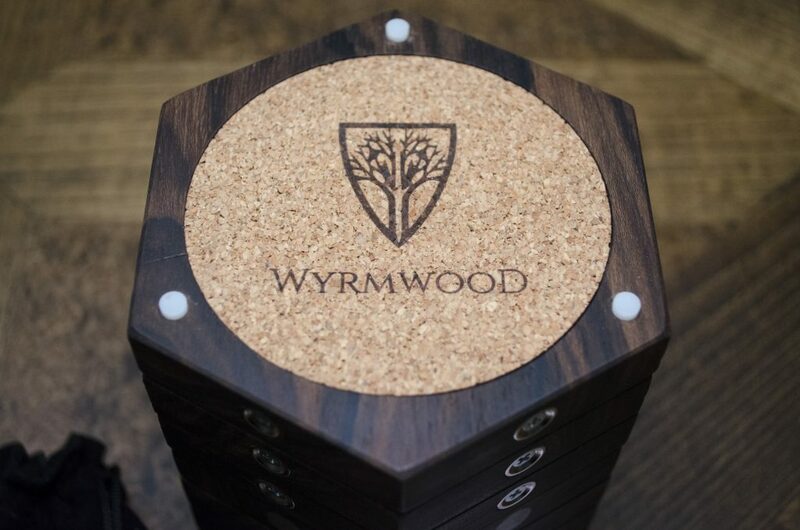 Bonus Point: the back side of this tile in particular is not a lined with cork to double as a coaster- it instead has the Wyrmwood logo laser engraved like the top of their dice vaults. A little oddity out of the bunch, I can tell the folx at Wyrmwood enjoyed cooking up this li’l guy. Seven brass pins circle the center of the tile’s hollow, just large enough for a standard sized 16mm die to fit inside. The intention, I’m told, is to isolate a single die so that it doesn’t spread its miserable bullsh*t luck to the rest of your dice, surrounding and mocking them in their brass prison. I’m very torn on this particular tile. The IDEA is pretty impressive. 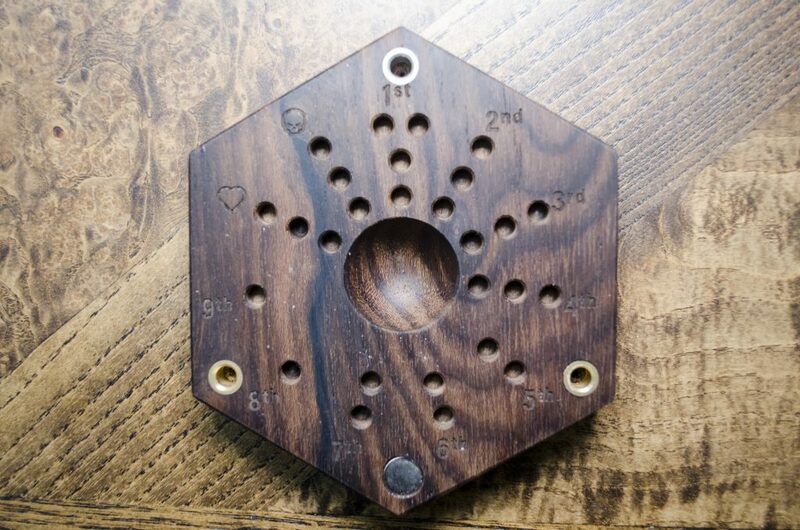 It has small holes drilled in outward running lines from a central hollow. 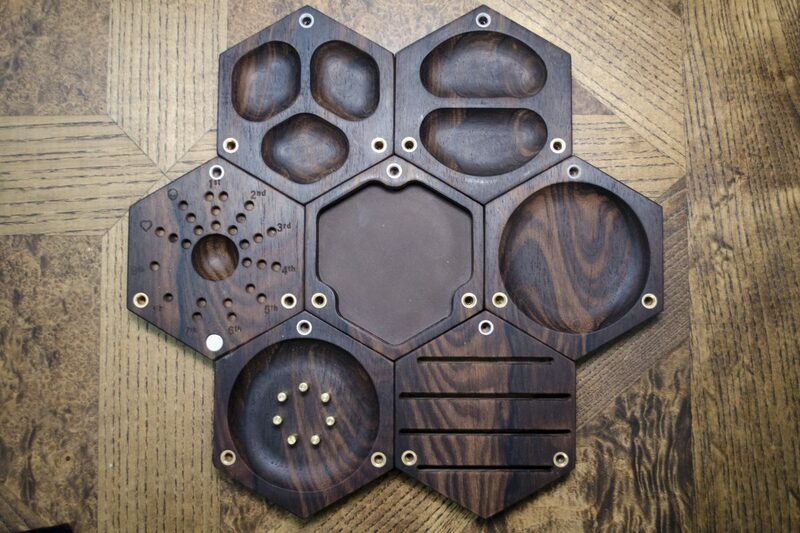 The tile comes with a number of tiny ball bearings that can be used to fill the various holes as well as a small magnetic game piece used to pick them back up. 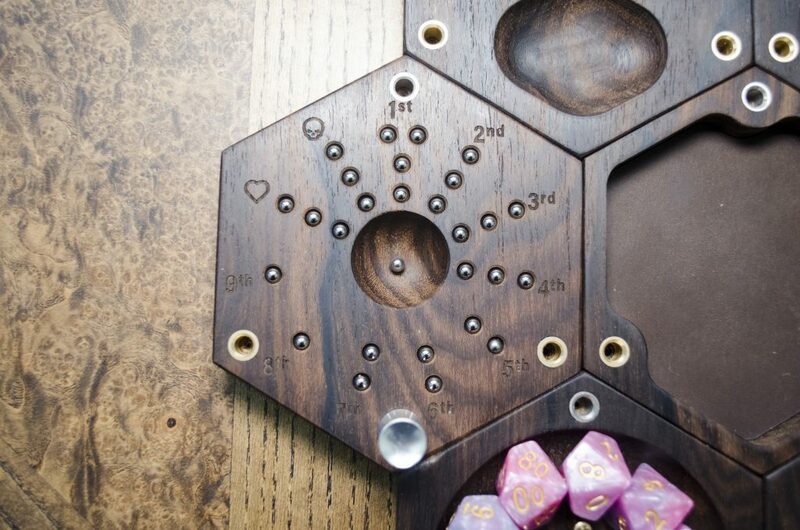 The various drilled holes represent spell slots of 1st-9th level and death saving throws (failures and success) for 5e D&D. As an idea, I love it. But in practice, the numbering and icons are a little difficult to read (in all of the photos I’ve seen and in person). I love the idea of the BBs as tokens, but the little shits are hard to keep up with. I lost three in the course of filling the tray for the first time. Let alone if you drop the thing. The tile is also made exclusively for 5e D&D. And since over 80% of games are run between level 1 and level 14, some of the slots will almost never be used. It’s the most labor intensive tile to make and the most expensive tile to buy with the fewest potential uses. So consider this one a highly specialized luxury item. It’s not going to be for everyone – but I do appreciate where their head was at when making it. Lets do a quick “TL;DR” rundown of some of the best aspects of these tiles. + Incredibly well made: Satin finish, beautiful wood, sturdy, strong, well designed. + Cool idea: modular magnetic snap-together tiles are just awesome, even if you just use them as coasters. + Stackable form factor: The peg-in-hole design makes them easy to stack and keep together for the most part. They look good from the side or the top. 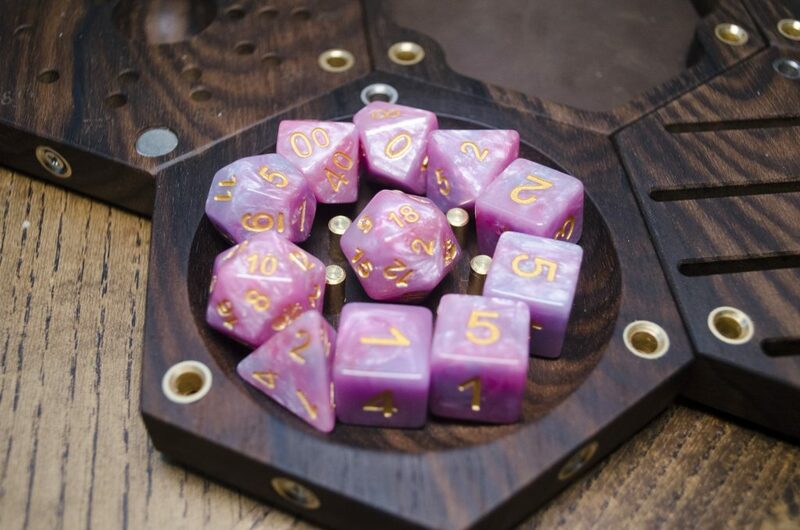 + Gorgeous exotic woods: Wyrmwood’s claim to fame, there are over two dozen beautiful woods to choose from. Including their “roll the dice” purchasing option that pulls your selection randomly from among them. + Fun little dice jail: The Tile of Shame is cool as hell. It can hold an 11pc set, it’s fun and well designed but not overstated and gaudy. + Useful Card tile: There are a thousand uses for the simply made card tile. It can double as an initiative or inspiration tracker, can hold active enchantments or planeswalkers for MtG for easier tracking, it’s just an all around useful well designed tile. Bonus: It can hang on your wall with a single nail. And that just looks freaking cool, no? Imagine having that in the game room for someone to grab a coaster from when needed. We never discuss the positives without the negatives. It’s only fair. – Not universally useful: The tiles vary in usefulness from game-to-game and player-to-player. 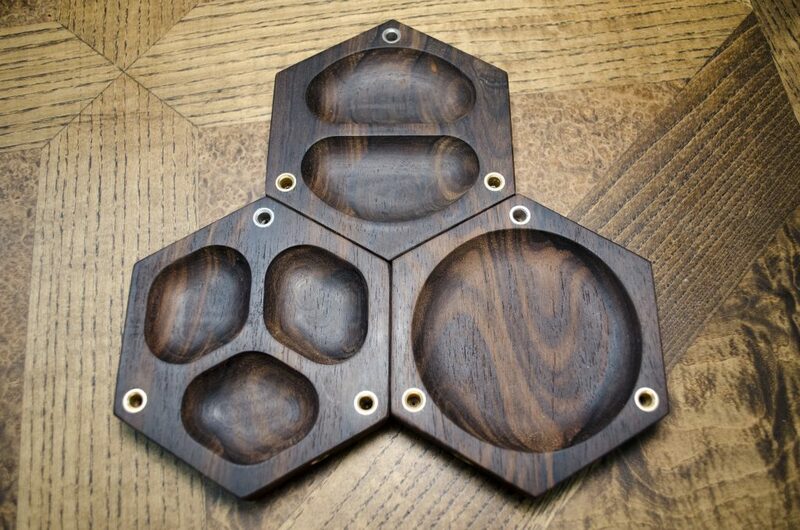 I feel like this is the first Wyrmwood product I didn’t just say “Get it.” Anyone who rolls dice can use a Dice Vault or a Dice Tray – not every game will need a stackable modular dice tile/coaster system. – No storage solution or travel case: Just a stack of wood held by the rubber/plastic feet – very loosely. I hoped the feet would “snap” into the peg holes of the following tile, but they just sit in there with no tension. – Not a perfect coaster: The rubber/plastic feet prevent some wider or larger cups from being used. It’s a little thing, but marketing a as a coaster does make this a limitation. No steins need apply. – The Caster Tile isn’t so very useful: Due to the slippery nature of ball bearings, there is a huge chance every time you use this, you’ll drop one. Though easily replaceable, I’m a very careful and precise person and have managed to nearly lose three of the little buggers while writing this review. – Cannot display sideways: The tiles when stacked work fine, if a little easy to topple. When turned on its side to be put on a bookshelf or something, the tiles repel each other. They come apart too easily for stacking sideways to be an option. Now kiss. I said KISS. I don’t come at these reviews with the intent to sell the product -nor- cut their legs out from under them. It’s all about improving in each iteration. Becoming better and better. So what would I like to see? 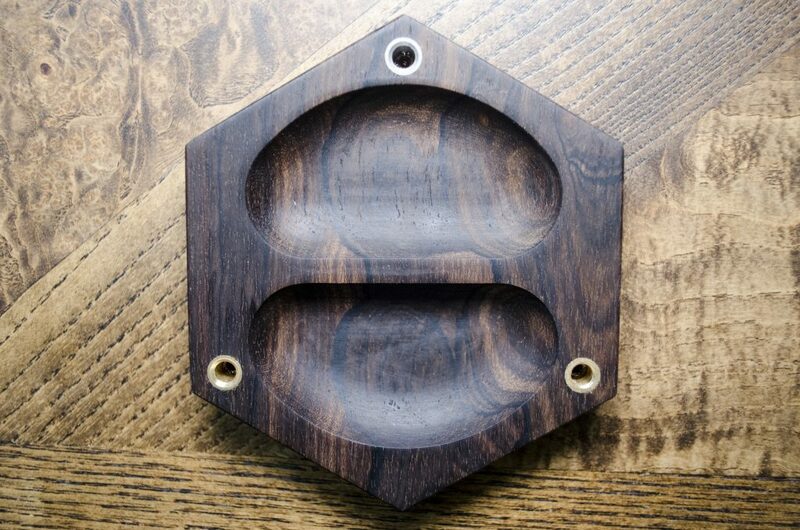 Storage Bracket: I know wood is their livelihood, as it should be, but I’d love to see a metal (or potentially metal inlaid) bracket that can snap onto the magnets on two of the sides. 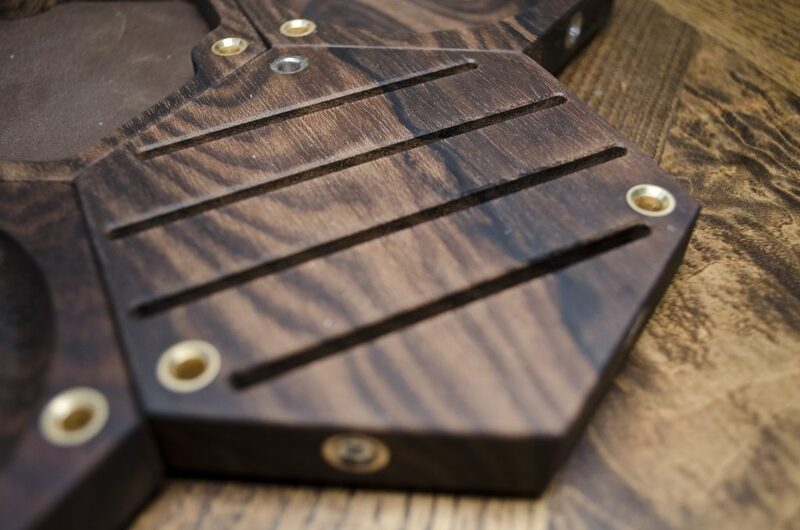 Something stylish and customary with Wyrmwood’s legendary craftsmanship. I tested the idea out myself using a small length of steel, and it worked. Something, ANYTHING, to snap onto the sides of these tiles to make them portable would be fantastic. Dropping them, conversely, would be horrific. Especially considering they can be nearly $100 a piece for the finer woods. Snap-in feet: An alternative to the Storage Bracket would be to find a way to make the black rubber feet fit snugly into the following tile. Tight enough to allow the entire stack to not accordion apart when on its side, at the very least. I fear that this option would not be a long term solution, as the rubber would very quickly degrade and fall apart from repeated snappings but it’s an option. 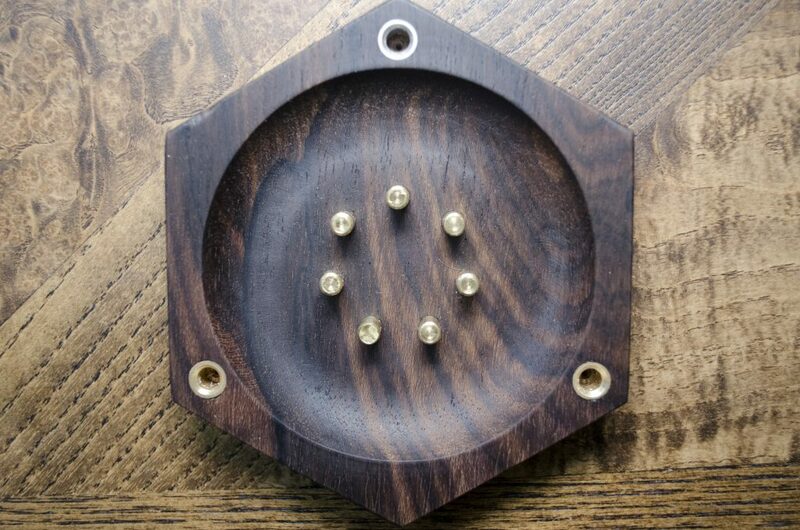 Wall Mount Plate: As soon as I hung the tile set from my own wall, I knew I wanted a thin hexagonal plate that I could screw to the wall. 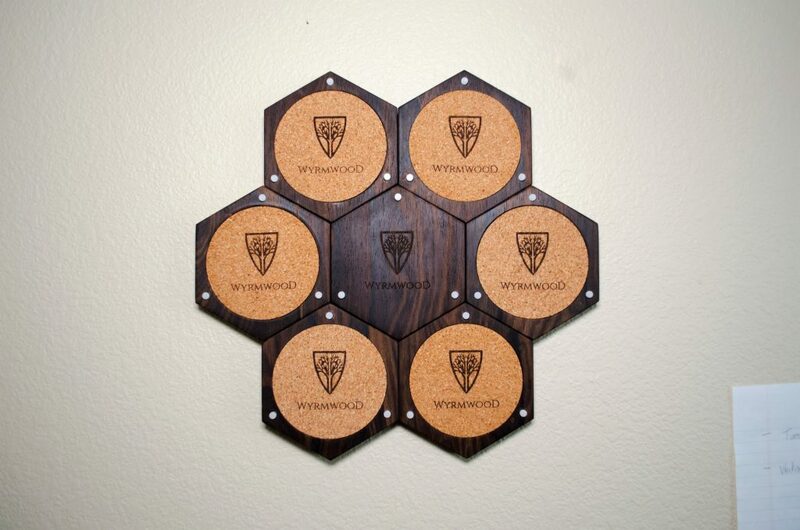 Something with the “Wyrmwood” logo on the front that you could snap a tile to (particularly the Rolling Tile, since it’s solid wood and not cork) and build shapes using your tiles. Is it mandatory? No. But would it be cool as hell? Yessir. 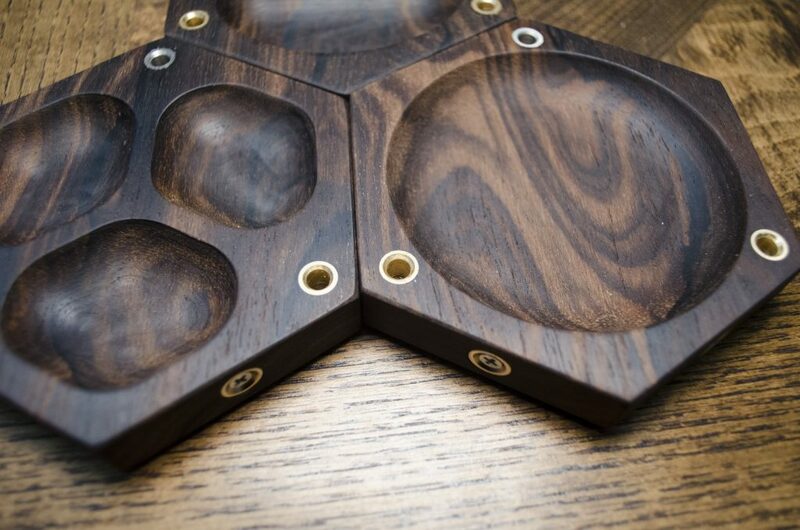 Out-of-game use: This is a 100% non-possibility, but part of the reason people love the dice trays, dice vaults, and adventure arsenals (no review, sry) from Wyrmwood are because you use them in game and out of game they keep your rather expensive stuff safe. 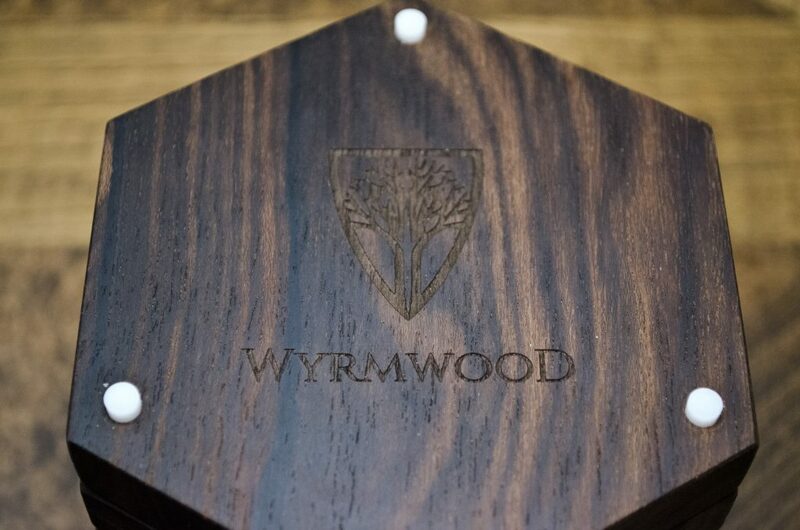 People store journals and books, pens and precious stone dice in Wyrmwood products. 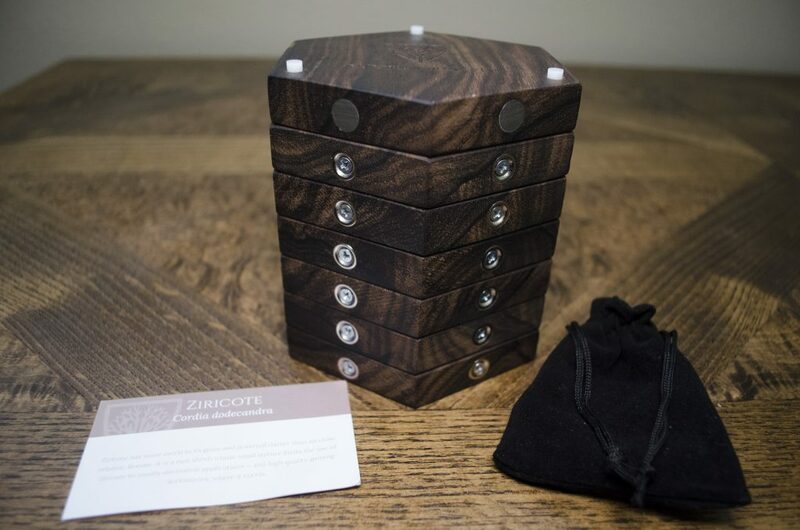 I hate they missed an opportunity here to let people who, like a friend of mine, have CARVED BONE Settlers of Catan pieces have a cool place to store their pieces. Only the smallest of the tiny pieces could ever be stored here, and that’s a shame. Even offering a “Coaster” and “Storage” option for each tray would have been a good call – anything to let them pull double duty. 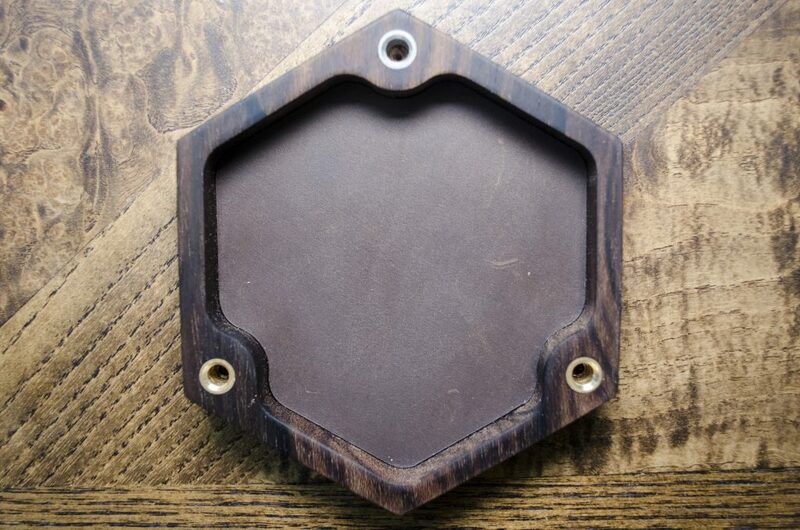 Pegs or Inlays or Inks or Something: I’d have loved to see Wyrmwood make tokens for the Caster Tile out of scrap wood. Like those peg-jumping games that use golf tees, perhaps. But bare minimum, I think the Caster Tile need an inlay or at the very least silver/gold/brass ink in the symbols to help see them more easily. The modular design is fun and interesting. 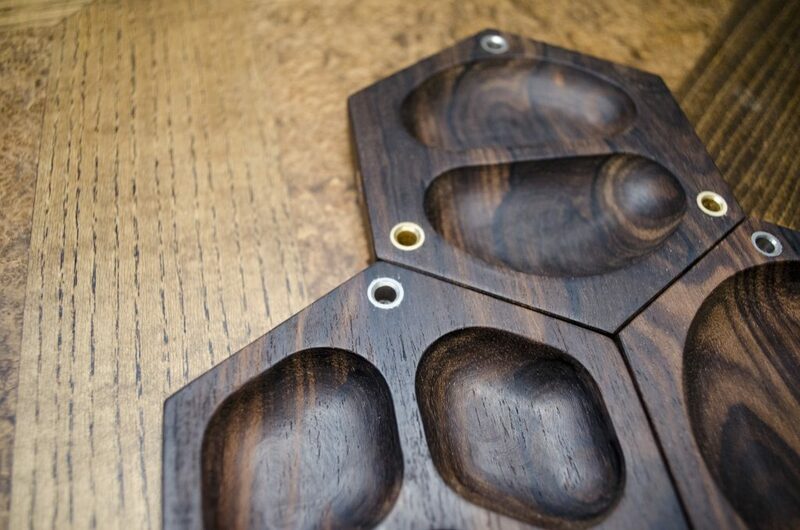 The Hexagonal shape has become a gaming staple (for some reason) but really makes this system look cool and functional. There is a tile for most occasions and many of them have several uses. The quality coming out of Wyrmwood these days has improved markedly since the first time I reviewed one of their products, and I’m overjoyed to see they have not become complacent. 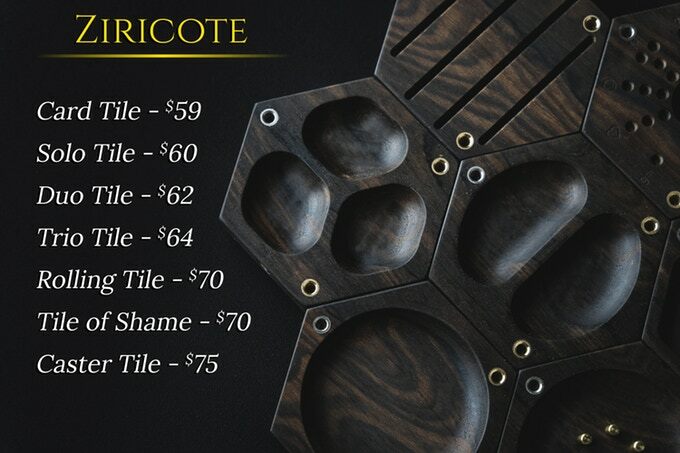 If you have a group of friends that love to play boardgames, you will undoubtedly love these tiles and want to jump into the (already 900% funded) Kickstarter as soon as possible. 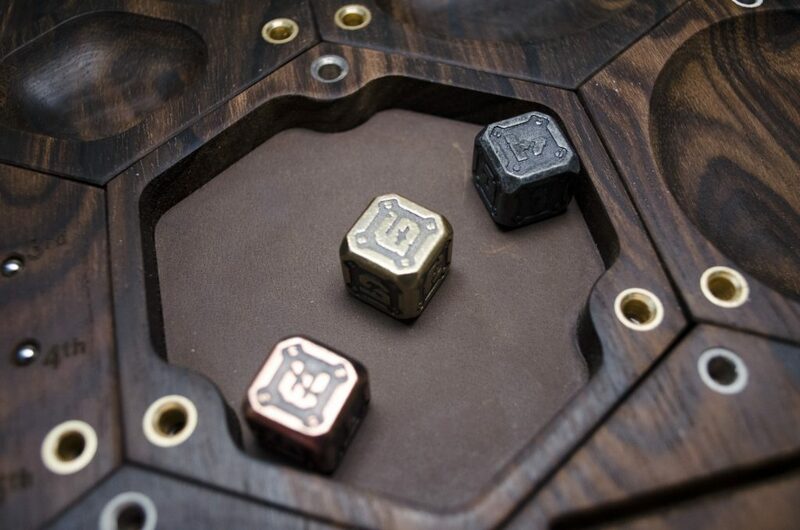 If you already have a Wyrmwood Dice Tray and Dice Vault… And Dice Tower System and Deck Box… and two more Dice Vaults and a Personal Dice Tray…. And an Adventurer’s Arsenal (jealous) – you may find use out of these tiles – but they’ll probably not be a “must buy” unless you’re a collector. Comment down below or hit me up on Twitter. I wanna know what you love, what you’d change. I don’t always advocate rolling, but when I do… be sure you have to Drop the Die. Review by JB Little, Follow me on twitter for more product highlights and dice giveaways!